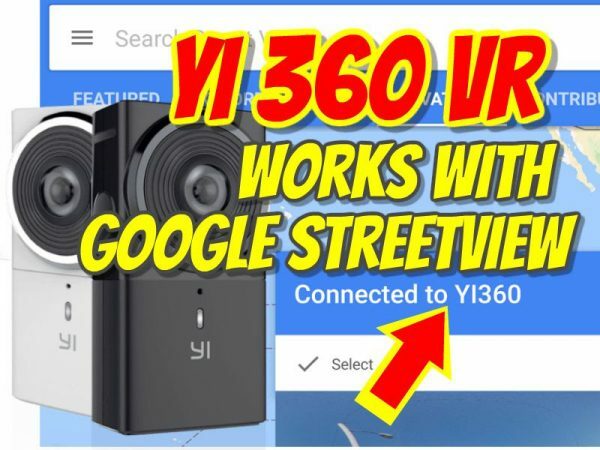 Yi 360 VR is fully compatible with and can be controlled by the Google Street View mobile app, making the Yi 360 VR’s workflow very easy for Google Streetview. Here are the Street View features! Yi 360 VR is the soon-to-be-released 360 camera with 5.7K video, and I recently found that it had the highest video quality among consumer 360 cameras up to $800, as of October 2017. However, it appears that Yi 360 VR has other tricks up its sleeve. I discovered that it is fully compatible with the Google Street View mobile app. Connecting Yi 360VR with Street View is very easy. You simply turn on the Yi 360 VR, launch the Street View app and press the camera icon on the lower right corner. A menu will popup and one of the options is link an external camera. When you tap on that, your phone will search for a Street View compatible camera. It found my Yi 360 VR automatically and I didn’t even have to enter a password. Once the Yi 360VR is linked, you will see a simple map view of your immediate location. You’ll have two buttons at the bottom: Single and Interval. – Interval lets you take a series of photos that will be automatically linked. When you tap the shutter, it will take a photo and will take another photo every time you travel a specific distance interval (not time interval; so it won’t take photos if you are stuck in traffic). In the shot below, you can see the spots where it took a photo. The photos taken in interval mode will be automatically stitched and sent to the app as a linked collection that can be uploaded together, or you can choose which of them to upload and which to omit. One thing I noticed is that on my preproduction camera, there was no vertical correction (horizon leveling). 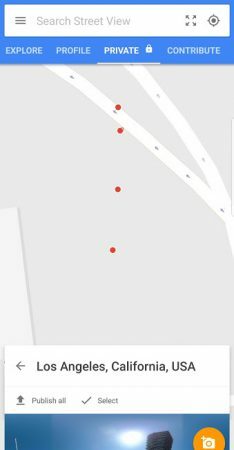 I would therefore recommend using a gimbal if you want to take photos for Street View. I can confirm the Guru 360 gimbal works with the Yi360VR. In any case, this is a welcome feature for mappers and adds extra value to the Yi360VR. The Yi 360 VR will be $499, due sometime at the end of October, but you can currently preorder it for $399 at B&H Photo. There’s supposed to be a feature that takes three photos and then stitches to hide the photographer. Any chance you could demo that if it’s available in the pre-production version. Hi there. This feature doesn’t seem to work on the iOS version of Street View. The camera connects to the app, takes the picture and a connection error appears. Everything involved is in its latest version. This is interesting camera, but instead of uploading images to Google Street View I’d rather upload to Mapillary.com service. This can be done by grabbing images from Street View’s Panoramas-folder, which is in Internal Storage\Pictures\Panoramas -location at least on Samsung Galaxy S6.